Hello Beauties! So far in my skin care routine I've covered Ocean Salt, Angels on Bare Skin, Eau Roma Water Toner and Celestial but there was one thing I forgot to mention. 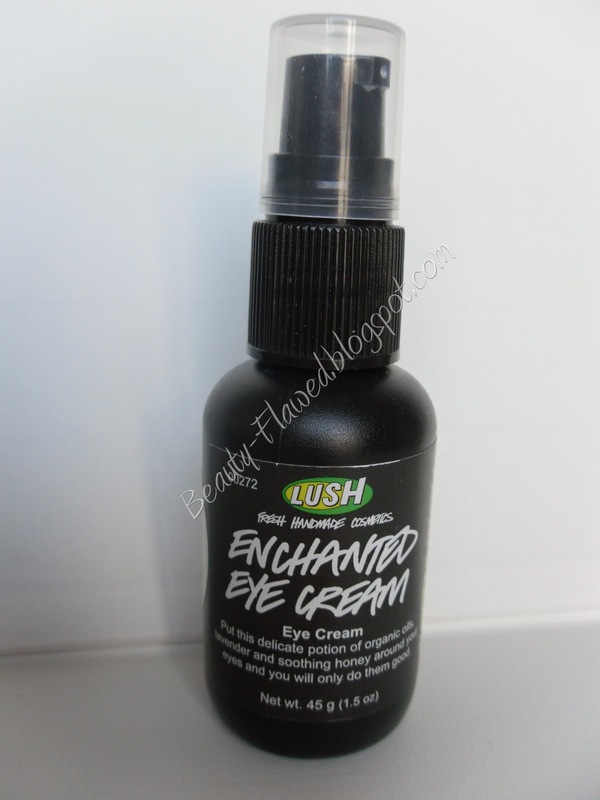 Enchanted Eye Cream! I've tried a lot of products in the past to help moisturize the dry skin I get around my eyes. I have found that a lot of drug store and high end brands were just too heavy for the skin around my eyes even if they were marketed for that purpose. If I use a moisturizer that is too heavy around my eyes I get these "Milk Spots" or Milia.. I've always had problems like this around my eyes and have to be really careful about what products I use. For those who are not familiar with it Milia are little white bumps that appear on the skin usually in new borns or on adults around the eye and cheek area. They do not hurt they are just very visible and they can be removed pretty painlessly by a doctor. What sets them off for me is too much moisture and oils around my eye area. Enchanted is made with light moisturizing ingredients so it doesn't make the area around your eyes feel greasy. The lavender honey water mixture really makes this eye cream lovely. Lavender and Honey have been used for centuries to help calm and balance skin. Since using this product I have noticed that the area around my eyes looks and feels refreshed and my dark circles are a tad bit lighter. It is also said to help prevent fine lines and wrinkles I can't really comment on this because I'm pretty young and I don't have any of those yet, but I hope it does! I use this day and night and it really helps to keep the dryness from washing off your makeup away. Even tho this is called a cream as you can see in the picture below it is pretty thin, a little goes a long way with this. I could easily use the amount pictured on both eyes with no problem. This is available on the Lush Website ($25.95 for 1.5 oz) or available in Lush stores. I know the price seems a little high but for as little product as you use it is quite a value, I've had mine for almost 5 months and still have more than half the bottle left not sure I'll be able to use all of it before it expires (It has a 1yr expiration date) . I sometimes like to use this on my whole face as well since its so light, its great for those hot humid summer days. Ingredients: Lavender Honey Water (Lavendula hybrida), Mel, (Aqua) Stearic Acid, Cold Pressed Almond Oil (Prunus dulcis), Glycerine, Cold Pressed Jojoba Oil (Simmondsia chinensis), Cetearyl Alcohol, Triethanolamine, Methylparaben, Propylparaben. Overall I'll keep buying Enchanted Eye Cream I think its a great value and I'm super happy I've found something that works well around my eyes. If your in the market for a great eye cream and have sensitive skin around your eyes as well Enchanted Eye Cream just might be the one for you too.